“She reminds me of old photographs of Italian Greyhounds”. Trots ett sparsamt utställnings år blev Poema årets tik 2:a.
Poema startade året med att bli BIR i Göteborg, SKK Int 7/1-01. Hennes dotter Py’s Haza (e S & N Ch Sobers Vivaldo) , född 001023, blev BIR-Valp på SvVKs utställning i Köping 24/2-01. Knows how to make the most out of life! 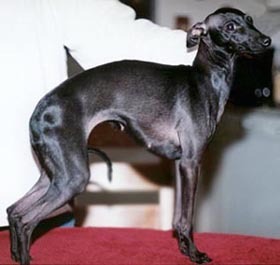 Poema has several BOBs, her greatest success was the Swedish Sighthound Club Show in Enköping Feb -99 where she made BOB by judge Johan Juslin (SF). At the Sighthound Club Show in Vårgårda June -99 the judge Wilfriede Schwerm-Hahne (D) wrote the following: …”she reminds me of old photographs of Italian Greyhounds”. Although sparsely shown last year Poema was second best female of the year. Poema started the new year with BOB at the international show in Gothenburg. Her daughter Py’s Haza (by:Swe Nor Ch Sobers Vivaldo) , born 23.10.00, was BOB-puppy at SvVKs show in Köping 24.2.01. She looks very promising and will be shown during the year.